There is a building under construction in Major Kanhangulo Street in the Angolan capital, Luanda, which stands as a prime example of how that country’s President manipulates the national treasury as though it were a private fund for the benefit of himself and his children. It’s called the Imob Business Tower and there is a paper trail that links it directly to President José Eduardo dos Santos and his family. On September 12, 2014 the President ordered the Finance Ministry to proceed to acquire the Imob Business Tower, then in the first phase of construction, for US $115.4 million. This is documented as Presidential Order No. 182/14, to authorise a real estate transaction between the seller, a private company called Imob Angola – Empreendimentos Imobiliários Lda., and the purchaser, the Government of Angola. Construction of the 35-storey building, designed to be the tallest and slimmest building in the country, was in the hands of a Portuguese firm, Mota-Engil, which had started work in 2013 with completion scheduled for 2017. The total cost of the works was estimated at around US $40 million, according to information placed into the public domain by Mota-Engil. So far, construction has reached the 25th floor. At the time the presidential dispatch was issued, Imob Angola’s owners were listed as Mayra Isungi Campos Costa dos Santos (the wife of the President’s son, Filomeno José dos Santos, known as “Zenú”), and a Brazilian entrepreneur named Valdomiro Minoru Dondo, with 45% apiece. The remaining 10% was held by one Óscar Tito Cardoso Fernandes, who happens to be a very good friend of the Finance Minister Armando Manuel. Is it just coincidence that both Óscar Fernandes and Armando Manuel are also very good friends of Zenú, who recommended his buddy Armando for the Finance Ministry job back in 2013? The Zenú who has a number of shared economic interests with these two friends (the subject of a separate Maka Angola investigation)? The same Zenú (did we mention he is the son of President José Eduardo dos Santos?) who has been put in charge of the Angolan Sovereign Fund, which was set up to ensure that some of the earnings from Angola’s oilfields were invested for the nation’s future, after it was discovered that billions of dollars of earned foreign exchange revenue from Angolan oil had simply “disappeared”? A mere ten days after President Dos Santos signed the order for the Finance Minister to acquire the Imob Angola building, Imob Angola’s partners transferred their entire holdings to two ‘phantom’ companies: Incasa and Bertoli (Incasa – Empreendimentos e Participações Lda and Bertoli– Investimentos e Participações, Lda.) owned by two previously-unknown individuals: Maria Isabel José e Domingas Zanda Muenho. Maka Angola has been given documents which show that on the date of the transfer of Imob Angola to them, Maria Isabel José was living in the Sambizanga neighbourhood, one of Angola’s ‘musseques’ (a slum), in a street with no name and a dwelling with no number. In turn, Domingas Zanda Muenho was living in the Prenda neighbourhood (in its slum part), also in a street with no name and a house with no number. This strange coincidence attracted attention – because anyone in the Angolan capital with sufficient capital to buy out a multi-million dollar business would be living in far more luxurious circumstances, than the ‘musseques’. And yet – according to documents seen by Maka Angola – on September 25th, Minoru Dondo sold the land on which this tower block was being built for US $6.8 million to Incasa. The sum also included a total buy-out of Imob Angola. As a result he was not a party to the transaction with the Finance Ministry. The Ministry acknowledged the exit of Minoru from the business three days after the presidential decree ordering the purchase of Imob Tower. Incasa is a business nominally owned 50-50 by Óscar Tito Cardoso Fernandes (Zenú’s buddy) and a Brazilian named António Carlos Perruci Loureiro Alves, who initially worked for the Macon bus firm until 2010 when he emerged as one of Zenú’s circle of business friends. Witnesses (speaking on condition of anonymity) have told Maka Angola that António acted as the Zenú’s front man for the Imob Tower transaction. He was also supplying the software for the Finance Ministry’s General Tax Authority, in effect giving him control of that database. Two months went by. Then on November 28 of 2014, Finance Minister Armando Manuel issued a despatch of his own, No. 1610/14, delegating powers to the Secretary of State for Patrimony, Franco Burity da Silva, to sign the promissory contract for the sale and purchase of the Imob Angola building. By that time Imob Angola was in the hands of Incasa and Bertoli. Mayra Isungi dos Santos and her husband José Filomeno dos Santos “Zenú” (right). Two weeks later, on December 15, Zenú’s wife Mayra (just to remind you: the President’s daughter-in-law), appeared before the Notary Public Registry’s Records Office in Kilamba as the official representative of our slum-dwelling millionaires, Maria Isabel José and Domingas Zanda Muenho. No prizes for guessing that Mayra then proceeded to transfer into her own name 70% of the Bertoli holding, with the residual 30% in the names of her three daughters (minors whose father is none other than the President’s son, Zenú). It’s worth repeating: the company registered as Bertoli with the owners living in the slums, was now re-registered with ownership split between the President’s daughter-in-law and grand-daughters: Zenú’s wife Mayra Isungi Campos da Costa dos Santos and their three daughters: 10 year-old Dahlia, 7 year-old Amarilis and 3 year-old Anise. You’ll recall that Zenú’s star was rather eclipsed by his elder half-sister and reputed ‘richest woman in Africa’ Isabel dos Santos who claims to have earned her billion-dollar fortune through keen entrepreneurial instincts shown when she started selling eggs at the age of 6. At least Zenú can now boast that two of his little girls started their capital acquisition even younger. Thanks to their grandfather’s corrupt schemes, these little girls are now firmly on the road to success in the real estate business. What justification is there for the Finance Ministry and Real Estate Commission to occupy a 35 storey building when a new seat for the Finance Ministry is also already under construction? And why did the Ministry not follow procedure as laid down in Article 28, 1b of the 2010 Public Probity Law? Maka Angola put these questions and more to the Finance Ministry, which has declined to respond to date, even though these questions were submitted in writing on May 13 this year, with a request for clarification regarding the Ministry’s part in this dodgy real estate deal. “The public agent (in this case, President dos Santos via his delegate Armando Manuel and Armando Manuel’s delegate Burity da Silva) is prohibited from intervening in the preparation, decision-making or execution of acts and contracts in the following cases: (b) when he himself, or as the representative of another person, has an interest in it through a spouse, or direct relative…” (e.g. son, daughter-in-law, grand-daughters). Maka Angola also contacted the other parties to ask for their version of events, but without success. None of the participants wants to answer any questions. Are we surprised? The story would not be complete without a further snub to the law. With the sale of the building to the Ministry of Finance, supervision for the works became the exclusive responsibility of a company called BDM (BDM Engenharia e Tecnologia Lda.). That happens to be the same company that designed the building. And who owns BDM? According to a notarized entry in the registry dated April 10th, 2014, they are a Brazilian national named António Carlos Perruci Loureiro Alves (who owns 67.5%), an MPLA Member of Parliament and former Chief of the General Staff of the Angolan Armed Forces named General Armando da Cruz Neto (owning 20%) and Óscar Tito Cardoso Fernandes (with 12.5%). Maka Angola contacted a civil engineer and specialist in public works to ask whether it was normal practice for the design firm to be awarded the contract to inspect the works. Unfortunately for Angola, recent statements by the Attorney General of the Republic, General João Maria de Sousa, hailing his fight against corruption, do not amount to anything other than an act of supreme cynicism and hypocrisy. Under Angolan law, the Office of the Attorney-General reports to the President. Dos Santos is the Attorney-General’s boss, as well as boss of all the State attorneys who are charged with prosecuting criminals and upholding the laws of the land. Without guaranteed independence, how can General João Maria de Sousa be anything other than his master’s puppet? He occupies his position thanks to the patronage of the very President who is robbing Angola blind. To keep his job, he does what the President commands. 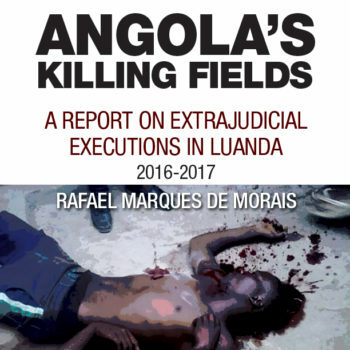 So in effect the Attorney-General’s role is restricted to locking up those who dare speak out against the President, such as the 17 Luanda Book Club activists, the “Revús”, who are currently rotting in jail while awaiting an appeal against the show-trial, conducted without regard to due process, that convicted them of conspiracy to mount a rebellion. If anyone is violating the Angolan Constitution, thumbing his nose at the laws of the land while committing blatant crimes (to fill his pockets and those of his family members), it’s José Eduardo dos Santos. The blatant way in which Angola’s President has looted the country for the benefit of his own family makes one question whether the millions of members of the ruling MPLA party have any sense of political, moral, social or patriotic responsibility given how they defend their party and president to the detriment of their country and in defiance of all the evidence. The same question could be put to those serving in the Angolan Armed Forces and National Police. What is Angola to them? Is it just the MPLA’s Angola that they are defending? Is their duty to defend the criminals looting the country or to abide by the Constitution and Laws of Angola to uphold law and order? There is a mountain of evidence, growing by the day, to warrant the impeachment and prosecution of the President and his accomplices if only men of honour were prepared to act. Who now can doubt that dos Santos is a serial thief. And thieves do not belong in the presidential palace. They belong in jail.